Faced with this tight schedule, our team set to work determining the steps involved, literally hour by hour, from 6 p.m. Saturday of Memorial Day weekend to 9 a.m. the following Tuesday when the bank would reopen. For more than three years, the bank had been coping with a moisture intrusion problem. After trying several “quick fixes” to no avail, they called Terracon. As the project manager, we assessed the situation and, with a firm understanding of the timeframe required, developed a solution to resolve the issue once and for all. Our first calls were to epoxy sealer and concrete patch product representatives to identify the materials with the fastest cure time available. With a cure time confirmed at a pace that would not delay the project, we next secured local waterproofing companies that routinely perform these types of slab-sealer projects. After emphasizing that the schedule was not adjustable, contractor representatives quickly embraced the challenge and confirmed their commitment. The day finally arrived, and the subcontractors were spot-on with their initial work. We were on schedule approaching midnight on Saturday. However, as the vinyl composite tile (VCT) and other materials were being scraped off the floor, two abandoned Walkerducts were found in very different condition from those we saw in the mock-up exploration. These underfloor ducts were completely deteriorated, filled with water, and needed to be removed. Standing in the middle of the bank at midnight on Saturday with the carpet already pulled up, our team decided to remove the ducts, knowing it might extend the schedule. The ducts were corroded to the point that they simply couldn’t remain. It was “all hands on deck” to pull them out prior to patching the concrete floor. 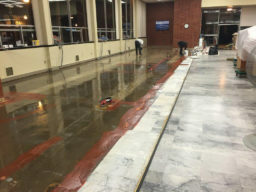 Once the floor was patched, the epoxy waterproofing sealer was applied, new carpet installed, and all furniture moved back into place. We were even able to pick up some time on the schedule from what was lost during removal of the Walkerducts. 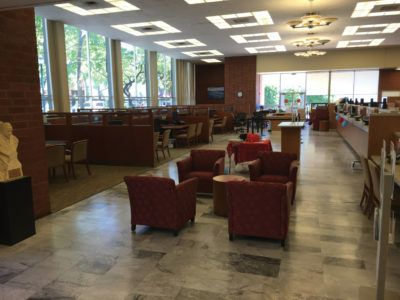 The last steps of reconnecting wires and cleaning up were completed in time for the bank to open Tuesday morning-with several hours to spare. We delivered a solution to a chronic moisture intrusion issue by bringing together a group of professionals to keep the project on track. Using pre-task planning coupled with resourcefulness to solve unforeseen challenges, this project was completed in 60 hours; no problem! Andrew Weber is a senior architectural consultant with our Oakland, Calif., office. He has extensive experience in exterior building enclosure investigation and repair of both historic and contemporary buildings. Andrew has been involved with concept and design development, construction document coordination, construction administration, and comprehensive project management. His portfolio includes work for industries including banking, residential, hospitality, retail, offices, healthcare, prisons, and museums.